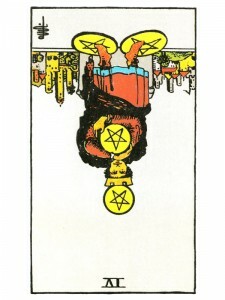 Four of Pentacles (R) – Emotional excess – you have acted without giving yourself time to think. The energy has been released – allow yourself to experience the generosity and freedom as you begin to give your life some structure. Grasping material possessions to tightly only closes you off from personal development. Honor your inner and outer limits now. Once you have become completely centered and stable within yourself, having found the security “within”, you will no longer need to hold onto anything in the material world. You will recognize that when you are confronted with loss or obstacles, you need only establish new plans and have them ready. Opposition can delay future plans, so when a situation is unstable – put a halt to unnecessary spending. Contentment of the moment may lead to an important oversight. Greed and other forms of physical insecurity not justified by circumstances. Miserliness out of fear that you will not have enough for yourself. Refusal to use your money or resources – hanging on to them will eventually lead to ruin, just as a body not used atrophies. Acquisitions in order to impress rather than for true personal appreciation. An undesirable turn on the physical path. Abuse of physical power and position – physical abuse. What is keeping you centered? What do you want to hold on to or possess? Who or what do you need to protect? Wheel of Fortune and Seven of Pentacles: Carry out your plans. Success is all around you and you can benefit from this good cycle. Three court cards and Tower in the spread: There is a possibility of great loss – attend to your affairs and do not allow yourself to be influenced by others at this time. Next to Moon or High Priestess: Investigate any proposition completely and do not sign anything until you are absolutely sure – there are undercurrents present in this situation. In the first position: It could fall to you to deal with the more uncivilized aspects of human occupation of planet Earth or to bring mankind to substantially greater heights with giant steps forward. Physical demands on you may be great as many will call on you. In the second position: You may have so much more than you need in resources that it becomes a problem of its own. However, the interpretation for the opposite extreme is that you do not have the physical/material resources you need for the project at hand. In the third position: Use your financial resources positively. On one extreme, do not try to keep everything for yourself; on the other extreme, do not think you have to invest in everything and everybody. A change in or information about, the condition of your physical foundation. Whether it is financial or health or another of the possibilities presented above in the general interpretations, will be clear when viewed with all of the other cards in the reading, particularly the other cards in the positions of the present and near future positions. In the fourth position: A passion for power and control. At one extreme, you may find yourself uncomfortable with anyone other than people of means and with physical situations that take place in anything short of luxury. Or, an offshoot of the same extreme, comfortable only with healthy people. Your passion in this case will be toward the opposite, toward the less affluent or even the destitute. Here also is a passion for the unhealthy – a love of weakness. In the fifth position: Concerned with one or more of the aspects of your physical/material welfare. Either something has happened already that you wish to correct or you are making contingency plans because you are worried something might happen. In the sixth position: Be wary that you do not let distortions or problems with the Physical Plane adversely affect your relationships/creativity. If your physical/material well-being has been at the center of your desires, you may find this changing in the near future. Expected financial backing may not materialize. In the seventh position: You may be diverted from questions about your health, finances and such. You may decide that your physical affairs are not as they should be and plan to make major changes. They could prove to be far better or far worse than you thought. In the eighth position: Conversely, this suggests that you are doing either outrageously well or that there have been some difficulties. In the ninth position: Perhaps there have been dreams or daydreams raising some difficulties in your physical/material plane. This feeling you have may only be in your subconscious now. This reading is to help bring it up into the light of day. There could be emotional abuse through physical means. In the tenth position: Neither squander your resources unnecessarily, nor refuse to invest in what is prudent.